We’ve often been criticize for the fact that despite being a travel blog, we do not share/promote enough about our home country that is Singapore. But things are about to change and now there has never been a better reason to visit Singapore! We’ve never felt happier and more excited to share news with our fellow foodies of the world, but if you think Michelin star worthy food has to cost a bomb, STOP RIGHT THERE! Recently, Singapore has just been listed as the first Southeast Asian country to be rated by the Michelin Guide, and two of our very own hawker stalls (yes you read that right, HAWKER STALLS; Singapore’s street food equivalent) were awarded one Michelin Star each! And they are Hill Street Tai Hwa Pork Noodle with prices starting from just SG$5 (USD3) at Crawford Lane and Hong Kong Soya Sauce Chicken Rice and Noodle -SG$3 (USD2) in Chinatown. This will go down in history as its a first for an Asian street stall to be awarded such an honor. If that’s not enough a push for you to visit Singapore soon, these newly crown Michelin Star chefs have stated that they do not have any intention to increase the prices in the near future. So if you have been living under a rock and have no idea what a Michelin Star is, it’s a internationally recognized food judging criteria which has made Chefs like Gordon Ramsey who they are today. In layman terms, basically the more stars you’re awarded, the better your food is. Because of the strict criteria and prestige associated with Michelin Stars, Michelin Stars has traditionally been awarded to high end restaurants and famous chefs. 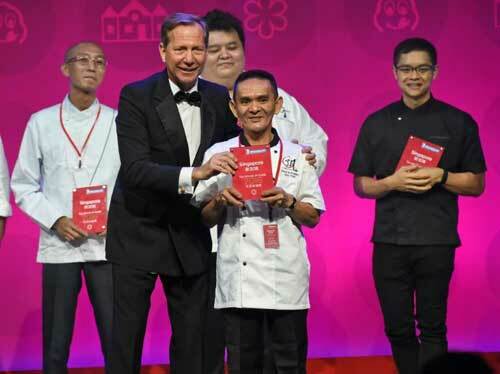 This is the first time a Michelin Star has been awarded to a Hawker/Street food stall. Among the other restaurants in Singapore that were also awarded Michelin Stars were Osia Restaurant, which was also the first time an Australian Cuisine has been awarded a Michelin Star, and Restaurant Joel Robuchon in Sentosa who were both awarded one and three Michelin stars respectively. 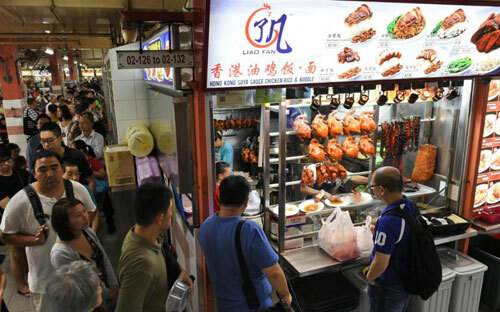 Prior to the ceremony, Michelin Guide has also awarded 34 other food places with a “Bib Gourmand”, which represents a reasonable price for the quality of food served in the eatery, where the benchmark for a reasonable price in Singapore is at $45. We have personally haven’t tried any of the above food places yet so we can’t do a proper review of the taste as of yet, but you can bet your money that our Singapore Food Blog would be giving them a visit very soon. And for those of you out there who are like us and plan to visit these extremely affordable Michelin Star Hawkers, do be prepared for a very long wait. On a normal day, waiting queuing time is said to be around 30~45mins. Since the announcement of their Michelin Stars, both hawkers have been said to have a queue time of anything between 2~3hours! Don’t forget to subscribe to us to know first hand when we do eventually get to do a Food review! 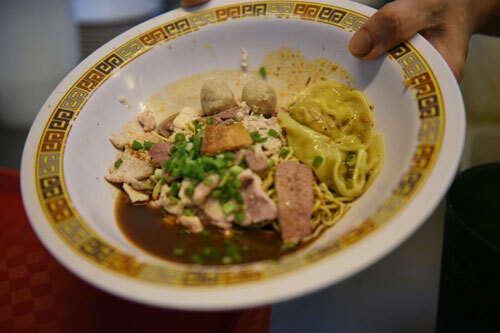 We were recently in Singapore and had a chance to try Hill Street Tai Hwa Pork Noodle. We got there about 5 minutes after opening and still had to wait in line for about 40 minutes. We ordered the SGD 6, which was plenty of food for us. The food was worth the wait though. The flavors were deep and complex and wonderful. The noodles were cooked to perfection; not over or under done. They take their time when preparing each bowl, which explains why the line takes so long. The liver was my favorite part of the dish as it just melted in your mouth. The sauce was nice and vinegary, which may not be for everyone, but I loved it. I would recommend this to anyone visiting Singapore, but try and go at off times because the line can be very long. 40mins is a relatively short time! Some queue up to 2~3 hours!